The IAEA asked to visit this military site because it has evidence that at least one building is alleged to have been the location of high explosive tests related to the development of nuclear weapons undertaken prior to 2004. However, after receiving this request, Iran undertook substantial reconstruction and site modifications. 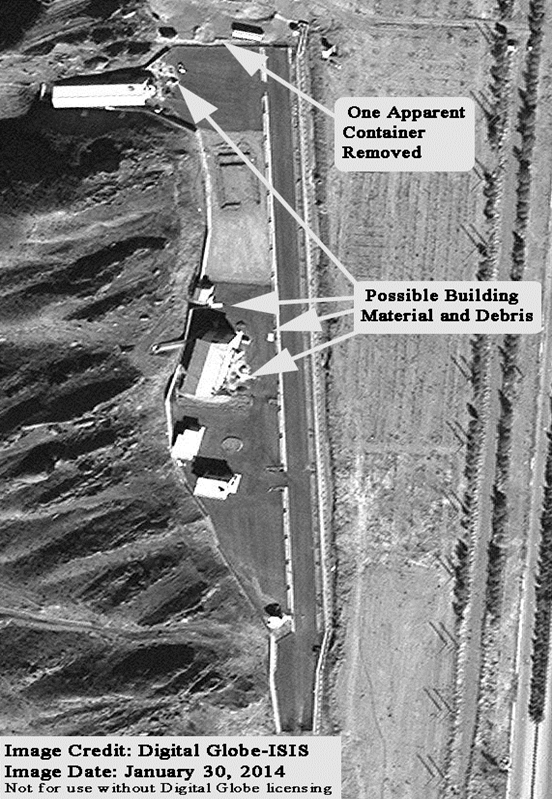 Satellite imagery shows that between early 2012 and the summer of 2013 Iran sanitized, demolished portions of, and reconstructed the site in an apparent effort to hide past activities and undermine the IAEA’s ability to conduct verification activities. ISIS has monitored developments at the Parchin complex since February 2012 and has catalogued changes at the site. These results are in reports available on the ISIS website. So far, despite repeated requests, Iran has refused to grant access to the site. Starting in the summer of 2013 and lasting for several months, little activity was visible at the site. November 27, 2013 imagery shows that no significant changes were visible at the Parchin site compared to earlier imagery from August 13, 2013 (see figure 2). For example, the areas that had previously been asphalted remained unchanged compared to previous imagery. The central area also remained unpaved. Moreover, the image did not show any exterior activity associated with large-scale alterations within the buildings. At the time, ISIS hypothesized that the apparent lack of visible changes could have meant that Iran had finished making the planned changes or made efforts to freeze operations at the site following the start of the presidency of Hassan Rouhani. January 30, 2014 commercial satellite imagery, however, shows renewed outdoor activity. Possible building material and debris are visible next to the main building (the one alleged to have housed the high explosive tests prior to 2004) and another suspect building at the north end of the site. In addition, what appears to be a container at the north end of the site has been removed (see figure 1). These changes are apparently the ones noted by the IAEA in the February 20, 2014 Iran safeguards report and listed among the issues that continue to create concerns about the hiding of possible military dimensions to Iran’s nuclear program. In the November 11, 2013 Joint Statement on a Framework for Cooperation signed by Iran and the IAEA, Iran agreed to cooperate with the Agency “with respect to verification activities to be undertaken by the IAEA to resolve all present and past issues.” The alleged nuclear weapon activities that took place at the Parchin military complex represent one of the major issues to be resolved under this Framework. Parchin is a key outstanding issue that the IAEA has placed at the heart of its concerns about Iran’s past and possibly on-going nuclear weapons work and other alleged military dimensions. Before the Parchin issue can be resolved satisfactorily, Iran will need to allow the IAEA to visit Parchin, provide other information and access to Iranians, and possibly permit visits to other sites. In sum, Iran will need to provide far more cooperation on this issue than it has done so far. If it does not, it risks not achieving a final deal with the P5+1 or receiving significant sanctions relief. The settlement of the Parchin and other outstanding military dimensions issues are now intertwined with the parallel P5+1/Iran negotiations of a final deal, called the “comprehensive solution,” under the Joint Plan of Action. By not addressing the IAEA’s concerns, Iran would fail to satisfy the objectives of the United Nations Security Council (UNSC) resolutions on Iran (which require P5 unanimity to undo). And senior U.S. officials have stated that Iran must satisfy the IAEA’s outstanding concerns for the United States to support the lifting of UNSC sanctions. Continued Iranian intransigence on the military dimensions issues would also make the U.S. Congress’ lifting of U.S. economic sanctions unlikely. In the formulation of recent proposed, albeit controversial, U.S. Senate legislation (SB 1881), there was disagreement over whether Iran’s centrifuge program should be banned, and the legislation in the end was ambiguous on this condition and did not condition a final deal on Iran not having a centrifuge program. However, this proposed legislation, sponsored by a majority of Senators, was clear that any final deal “must resolve all issues of past and present concern with the International Atomic Energy Agency (IAEA), including possible military dimensions of Iran’s nuclear program.” According to one close follower of Iran legislation, the intransigence of Iran on Parchin over the last two years has been a major factor in generating support for Iran sanctions legislation. The U.S. Congress is unlikely to vote to eliminate U.S. economic sanctions if Iran does not address Parchin and other military dimensions issues. Some analysts have argued incorrectly that issues like Parchin and alleged military dimensions do not matter. According to their reasoning, these issues are in the past and should be overlooked. These concerns do not appear motivated by disbelief that Iran was pursuing nuclear weapons. Only a few non-credible critics argue that position. Instead, these analysts appear motivated by a worry that Iran will never address the IAEA’s concerns and that intransigence on the part of Iran will scuttle any long term deal. “Focus on the present and future, not the past” is their mantra. But what kind of comprehensive solution can be achieved by ignoring the central concern of the crisis– namely that Iran has misused its nuclear programs to seek nuclear weapons and may do so again? What is the value of a deal if Iran is not willing to admit to its past work on nuclear weapons and allow the IAEA to verify the correctness and completeness of its statements, along with gaining assurance that any such work has stopped? What confidence can be placed in the ability of the IAEA to verify any final deal, if Iran can successfully defy a legitimate IAEA verification request? The answer is simple: that agreement would not provide assurance that Iran is not building nuclear weapons. It would have an impaired verification regime. Iran would feel emboldened to resist future IAEA efforts aimed at ensuring the absence of undeclared nuclear activities and facilities, efforts that will inevitably require visits to military sites. Those who want to forget the past also ignore another key fact. One of the most important lessons of the IAEA’s experience in South Africa, North Korea, and Iraq in the early 1990s is that understanding past nuclear activities matters to establishing certainty about the present and future. This realization helped propel a weak, ineffective inspection agency of the 1980s into the powerful verification force it is today. Failure to remember this lesson will condemn us to a comprehensive solution which retains an Iranian nuclear weapons breakout capability and a weak and ineffective inspection regime unable to detect Iranian cheating. Figure 1. Digital Globe Imagery shows the status of the alleged high explosive test site at the Parchin military complex on January 30, 2014. Figure 2. 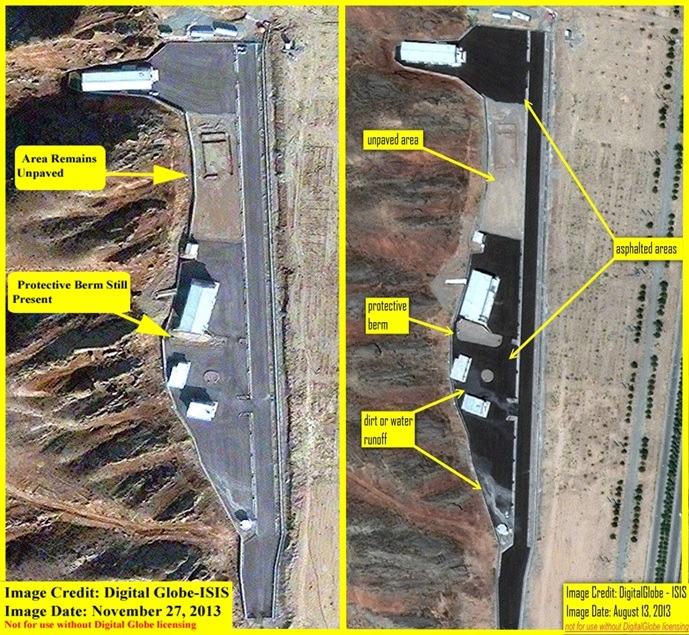 Digital Globe Imagery shows the status of the alleged high explosive test site at the Parchin military complex in August and November 2013. 1. Director General, International Atomic Energy Agency, Implementation of the NPT Safeguards Agreement in the Islamic Republic of Iran, GOV/2014/10, February 20, 2014, http://isis-online.org/uploads/isis-reports/documents/iaea-iranreport-02202014.pdf.